Your smile is like your signature, it is uniquely your own! At Roberts Dental Ranch, we are a unique practice, designed to meet all of your dental health needs. Dr. John Roberts and Dr. Raenie Roberts specialize in pediatric dentistry and orthodontics, offering comprehensive dental health care and braces for patients of all ages in Prosper, Celina, and Collin County. From your very first smile, to every smile throughout your life, we are here for you. Our practice provides a welcoming, comfortable, and fun atmosphere, where you and your family are treated with sensitivity, respect, and the attention you deserve. For new patients considering orthodontic treatment, we invite you to a complimentary consultation! Drs. 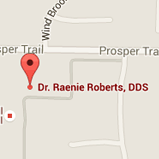 John and Raenie Roberts and the entire staff at Roberts Dental Ranch look forward to working with you and your family! If you have any questions about your dental health and the treatments we provide, or to schedule an appointment, give us a call at (972) 347-6444.